The release of Star Wars Episode VII: The Force Awakens and the promise of many more films and adventures to come, including the imminent Rogue One: A Star Wars Story, have brought enthusiasm for the beloved space-fantasy saga to an all-time high. 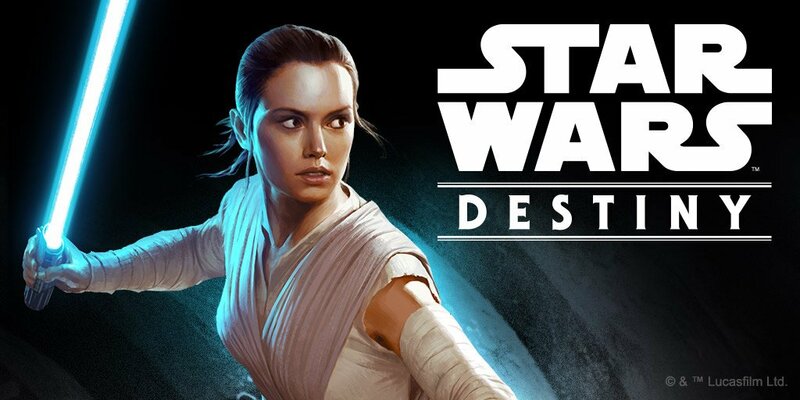 Into this climate, local gaming publisher Fantasy Flight Games is introducing Star Wars: Destiny, a collectible card-and-dice game featuring the iconic heroes, villains, and ships from across the Star Wars universe. After attending a special preview event where I got to try out the game for the first time, I’m confident that this will be one of Fantasy Flight’s top properties for years to come. Designed for two players, the game represents a duel between opposing characters in which strategy and luck serve equally important roles. Certain cards used in the game, including the character cards themselves, feature custom dice, which players roll to determine the types of actions and maneuvers that they can perform to shape the outcome of battle. At first glance, this design style would seem to mirror that of Dice Masters by WizKids, but as that game has players begin with a relatively weak dice pool that they must improve and develop during the course of play, it shares more in common with deck-building games such as Dominion and Tanto Cuore. The gameplay of Star Wars: Destiny, on the other hand, should feel familiar to fans of collectible card games like Yu-Gi-Oh! or Magic. On a personal note, I found that this style of gameplay resonates more with me as a player, as the actions available to me each turn are consistent and enable more advanced planning than I have generally thought possible in a dice-based game. Players take turns performing actions, one at a time, from playing cards to rolling the dice associated with those cards to resolving the effects of those dice. This back-and-forth exchange leads to quick, tense play that mimics the frenetic pace of the Star Wars films. Characters can be upgraded with weapons and abilities, increasing the number of dice they get to roll. The dice are of excellent quality, scratch resistant and with the images heat-pressed onto each side, making them sturdy enough to withstand frequent play. The edges are also rounded, giving them a bit more bounce than your typical dice, which is nice as it gives them more of a sense of randomness. I’m not the best at rolling dice, so I found this to be a valuable feature, as despite them being larger than the average d6, I had no trouble getting them to tumble around a bit before landing. Taking off my Star Wars–tinted glasses, I could see myself playing Star Wars: Destiny even if the source IP were something else, but that being said, the virtue of its being a Star Wars game definitely works in its favor. Whether it will receive the same widespread recognition that other games in Fantasy Flight’s Star Wars lineup have, however, remains to be seen. Always in motion is the future. 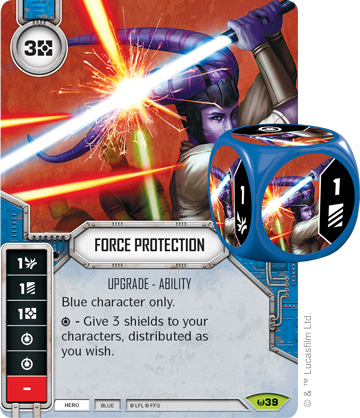 The collectible aspect has drawn some early skepticism, and while I am among those who have grown fond of Fantasy Flight’s noncollectible Living Card Game model, my concerns are assuaged somewhat by the fact that, like basically every Star Wars game that has ever existed, you have your light side and your dark side cards, and one of the game’s few restrictions is that these can never be mixed. As someone who generally prefers to be on the side of truth and justice, I am free to trade away any of my dark side cards and dice with more sinister players who might have what I want. 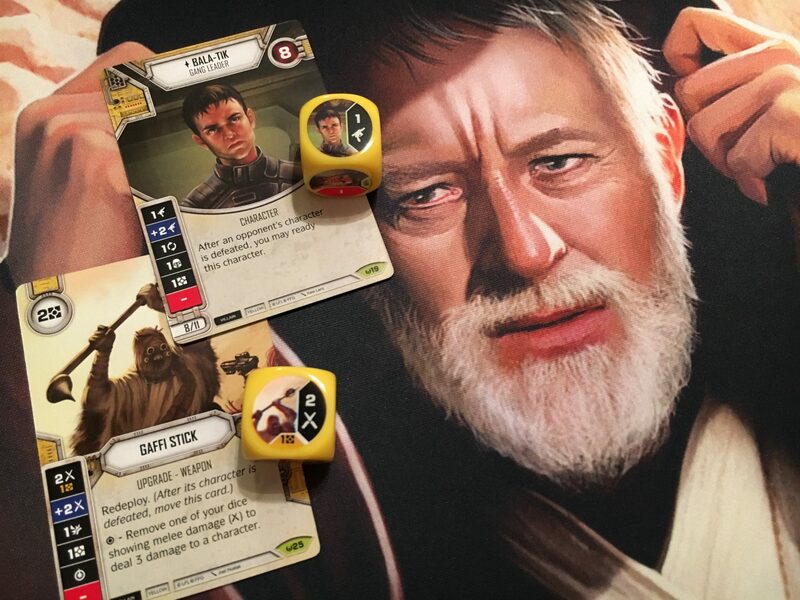 All told, Star Wars: Destiny is a well-designed, well-constructed game that is sure to appeal to many fans of both collectible card games and the Star Wars franchise. The game is available December 1, but you can check it out at the Fantasy Flight Games Center on November 20 as part of the official launch party. I’ll add this to my board game bucket list! This looks super fun.